The Bolder Boulder 10-kilometer road race is an amazing spectacle and everything it is touted to be. It is the fourth-largest road race in the world with approximately 40,000 runners registered. The number of runners is now so enormous that they must break us up into about 50 "waves" that are arranged based on a qualifying time in a recent road race. Each wave starts about one minute after the wave in front. In 1997, I run in the 19th Annual Bolder Boulder. The race is dedicated to celebrating the 25th anniversary of Frank Shorter's victory in the 1972 Munich Summer Olympics. This win was noteworthy for a couple of reasons. First, it was the first win in this event by an American in 64 years. Second, an East German "imposter" jumped onto the race course ahead of Frank just outside the Olympic Stadium, and the crowd cheered the imposter thinking he was the leader. Frank heard the cheers and thought that another Olympic event was occurring in the Stadium. When Frank entered the Stadium, though, he was greeted with silence. The crowd in the Boulder stadium 25 years later has been informed of this, and cheered loudly for Frank when he enters the Boulder stadium as he leads the "legends" wave (a group of legendary long distance runners). The race is entertaining. As always, there are several people providing entertainment along the race course. A number of bands play music. The infamous Bolder Boulder bellydancers are in three different locations along the way. I also catch a glimpse of the senior citizen women who are kicking up their legs like the Rockettes. Once again, as is my tradition, I do not "train" or engage in anything special to prepare for the race. I simply rely on my being in good enough condition due to my daily bike commuting, my work-outs at the fitness center and healthy diet. During the race, though, I regret this somewhat-primarily due to the fact that the oxygen is scarce in Boulder (the city is at an altitude of well above a mile). I achieve my goal, which is to run the entire 10K without stopping even though I had not run at all for two years. The altitude and low oxygen levels make the 10 kilometers seem like 100 kilometers to me. At the end of the course, there is a steep hill you must run, and my legs feel like lead. It is a cruel, fearsome uphill slope. Besides the entertainment along the course, there are other aspects of the race that make it highly enjoyable and memorable. Every day during the week before the race, the newspaper runs a large article (or several) about the course, the history, how to train, the records set, who will run in the race, etc. It really makes you realize how huge the race is, and gets your heart pumping fast all week just thinking about the big day. 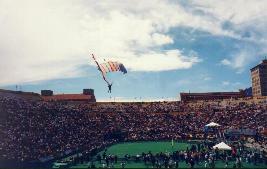 In addition, the end of the race is inside the University of Colorado football stadium, and by the time you get to the stadium there are a large number of people in the stands. They cheer you on as you approach the finish line, which makes you feel like you are either in the Olympics or that you are Rocky. Also, when you finish the race inside the stadium, you are given a lunch and beer and water. You then settle into a stadium chair to watch and cheer on the other waves that come into the stadium. The crowd is also treated to four air force jets which scream over the stadium, and four guys that parachute onto the 50-yard line to a big roar from the crowd (and I thought my parachuting was a big rush!). The photo shows one of the parachutists landing near the finish line. Other interesting items about Frank Shorter: It is said that his win in the 1972 Olympics was responsible for the huge increase in Americans jogging and running in road races since then. In essence, Shorter is the father of American running. He is also a founder of the Bolder Boulder. I will always remember my initiation to the Bolder Boulder, and expect to be back in the future. I highly recommend you consider trying it sometime! You will not be disappointed.